Paru en mai 2013, à commander ici. Gestalt therapy sees the therapeutic relationship as the occurring, the coming to light of a co-creation between patient and therapist. By means of clinical cases, the author leads the reader on her path of understanding of the Gestalt approach, which is focused on the desire for contact that animates relational unease and on the process that reveals its “music”. Thus the therapist stays in the here-and-now, but also supports the now-for-next, the energy of contact that in any suffering asks to be developed spontaneously. In these ten chapters, the author offers her readers a professional and human maturity developed over the thirty years of passion she has brought to her tireless work for Gestalt therapy in Italy and abroad. She expounds on many stimulating reflections on various aspects of the contemporary Gestalt approach: from the contribution of psychotherapy to contemporary society, to the new understanding of aggression, to the concept of the phenomenological field, to a redefinition of love in psychotherapy, to the passing from a dyadic to triadic perspective thereby overcoming the Oedipal epistemology, and to the support of the now-for-next in the couple, in the family, and in groups. 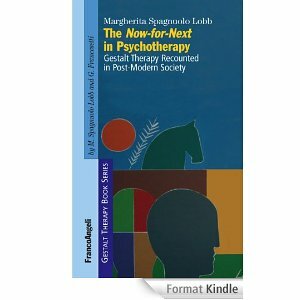 But the merits of this book are not limited to showing the interconnections among schools, or to updating Gestalt therapy to contemporary society, studying the technique in depth in various clinical contexts. For me this book has yet another merit: it leads the reader on an adventure that is not only intellectual but also engrossing from the emotional point of view. And this is a central characteristic of Gestalt therapy that has always fascinated me. Margherita Spagnuolo Lobb is a psychologist, a licensed psychotherapist, the founder and, since 1979, director of the Istituto di Gestalt HCC, approved by the Italian Minister for Universities, with premises in Syracuse, Palermo and Mi-lan. She is a Full Member of the New York Institute for Gestalt Therapy, past-president of the Italian Federation of the Associations of Psychotherapy (FI-AP), past-president and first Honorary Member of the European Association for Gestalt Therapy (EAGT), past- and Honorary President of the Italian Association of Gestalt Psychotherapy (SIPG). Since 1985, she has edited the Italian journal Quaderni di Gestalt. She has edited five volumes and written two books. The present volume has been published in Italian, Spanish and Russian.